The layout is this: Three cities, Shenzhen, Shanghai and Beijing, represent new waves of design in China. The first, Shenzhen — “Frontier City,” it’s labeled — was turned from a small fishing village on the Pearl River Delta into a center of graphic design in the 1980s and 1990s. Because it’s just north of Hong Kong, I suspect, Deng Xiaoping made it one of the first “Special Economic Zones,” opening it up for development, and it’s grown into a teeming megalopolis of 14 million people and, according to the U.S. Department of Commerce, the busiest port in China. Perhaps some of you knew most of this already; I’m fairly sure I’d heard of Shenzhen, but the details of this rapidly growing place never stuck in my head. Now some of them will. 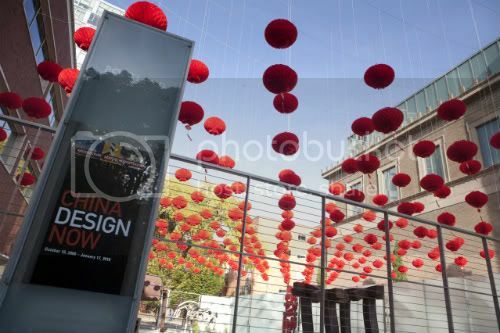 In “China Design Now,” the city stands for the future of design, and the show, to its credit, gives viewers the chance to witness a wide range of results. From CD covers to online magazines, from posters (some quite gorgeous) to Nike shoes, from videos to magazine covers, the work of young graphic artists in Shenzhen spills into a small, crowded space, overwhelming in its massive pile of stuff. No doubt the frenetic feel and de-centered exhibit staging reflect life in suddenly expanded and constantly expanding Shenzhen. Anyone who has spent time reading Peter Hessler’s stories on China will feel a rush of familiarity when the show talks about Shenzhen’s transformation. Check out his Oct. 26 New Yorker piece, “Chinese Barbizon,” for a mind-blowing deconstruction of the last 150 years of Western romance with oil painting and “genius,” for instance, or his award-winning “China’s Instant Cities” in the June 2007 National Geographic. But that kind of context has to come from outside of the show, which is remarkably limited in its textual information. Again, anyone reading articles on environmental devastation in China wouldn’t perhaps be surprised to learn that even as this show garnered rave reviews from the Oregonian and others, Greenpeace released a report titled “Poisoning the Pearl,” explaining that “the world’s factory floor” — that is, Shenzhen and other areas nearby — grow feverishly at massive cost to the river and all of the life around it. Not that PAM needs to say that in the exhibit (PAM would hardly have gotten to be the sole West Coast home for this originally Victoria and Albert Museum show with an obvious environmental agenda), but it’s part of the larger context of China’s economic growth. In the Oregonian, art critic D.K. Row says that Portland’s Ziba Design created “lucid staging” for this exhibit, a statement that made me literally snort in surprise. Great exhibit staging doesn’t have to be minimalist by any means, and given the number of people crowding into China’s megaplex cities — which is definitely emphasized by the jam-packed exhibit — some jostling, partial viewing and taking in fragmented bits of information are perfectly justified. Where will a viewer go next? What will she look at? Who could predict, given this conglomeration? Several people have said that the show is claustrophobic. Your mileage may vary, of course, and I’m pleased the museum was willing to experiment with a louder, more complex art experience. Lucid, however, it isn’t. Moving beyond Shenzhen to Shanghai, the “Dream City” of the exhibit, there’s a break in the narrative of success, of a city that loves beautiful clothes (they’re fascinating) and middle-class accoutrements. The step out of the driving narrative seems like a concession to reality, to people who do read about China outside of this exhibit, and that’s the “Shanghai Living” portion of the show. Portraits of workers who moved to Shanghai for opportunity and who work hellish hours under horrific conditions can’t help but make the show itself seem nearly spiteful. With that reminder, the show moves on to projects like “Thames Town,” a Shanghai suburban project that recreates classic English market town architecture (without the attendant Victorian smog and Dickens horrors, one hopes but doesn’t believe) and then, smoothly, into Beijing, “Future City.” Apparently, the future city contains a lot of architecture (which, forgive the broken record, has been the subject of much excellent writing by Paul Goldberger in The New Yorker, for instance, this piece, among many others). Looking at the creepy/glorious/impressive Rem Koolhaas-designed CCTV model (whether the building will ever be completed is up in the air, the various Olympics buildings like the gorgeous Bird’s Nest (supposedly to be transformed into a winter sports park) and others made a new impression on me, one that I imagine the show partly intends: I need to go see these things for myself. If the show doesn’t inspire hordes of Pacific Northwest visitors to China, I’d be surprised. (UPDATE: Though I feel that I should credit the museum for having many Touches [er, Touchs?] with this app available for checkout. Maybe the next-gen Touch will have a camera, and the next-gen PAM/PAM iPhone app will allow direct uploading of viewing photography to Flickr? I dare to dream!) On Fast Company’s blog, McCallion wrote several posts (here’s the first, the second and the most recent) about the show. The posts are PR, obviously, but they’re interesting PR, including links to the ways the show extends around the city. I didn’t pop into Wieden + Kennedy or the Goldsmith Gallery to look at commentary/other art about the exhibit, but McCallion points out that it would probably be useful in terms of understanding how PAM stretched beyond its usual exhibit strategy to reach some of the rest of the city. That info should be all over the exhibit’s exits, on the iPhone/Touch app and in what guards and front-desk clerks tell visitors. The Willamette Week’s reviewer calls the show an “exhausting exercise in PR bluster.” Yow: The show’s more than that, but, sadly, it’s not as splendid as its designers desired. ***** Read more from Portland Monthly/Portland Spaces’ arts writer (and associate editor) Lisa Radon, who likes it a lot more than I do (we’ll be having a Google Wave discussion about that soon, I hope! ), from PortlandArt.Net, whose reviewer says the show ”ushers in a new era for the Portland Art Museum and at the Willamette Week and Oregonian reviews listed above. If you go see it or you’ve already seen it, I’d love to hear your thoughts in the comments! “China Design Now” runs through Jan. 17, 2010, at the Portland Art Museum, 1219 SW Park Ave. Timed special exhibit tix are available on the museum’s website, www.portlandartmuseum.org, or by phone, 503-226-2811. $12, $9 stu./sr, free to members. Closed Mondays.